Check your library or city hall for old city directories or telephone books. Using multiple directories you may be able to build a list of former occupants of your home. The Wisconsin Historical Society has a large collection of these books. Plat maps, birds-eye views and real estate atlases can help you pin down the year of construction and track changes to street names. Birds-eye maps were made by an artist walking around town taking notes on building locations, sizes and shapes. He then went home and drew the map. They are fun to look and pretty reliable, but occasional mistakes were made. The Sanborn-Perris Company created maps of American communities to assist fire insurance underwriters to determine fire risk. S-P mapped over 300 Wisconsin communities and updated their maps every five years. Coverage varies but the earliest maps were made in 1883 and most continue through the 1930's. The Wisconsin Historical Society has an extensive collection and microfilm copies may be available at a local library or historical society. Tax rolls and assessment lists document the acreage, valuation and owner's name. These records can help determine the age of a house by noting changes in the properties value. A big jump usually means a house was built on the property. Many of these records are held in Wisconsin State Historical Society Area Research Centers statewide. For more information on the research centers visit www.wisconsinhistory.org/libraryarchives/arcnet/ or call 608-264-6460. A property abstract lists, in chronological fashion, all legal documents pertaining to a parcel of land. Included are references to deeds, mortgages, wills, probate records, court litigation, and tax sales--the essential legal proceedings that affect property ownership. The abstract reveals the names of all people who have owned the property, how long each owner had it, and how much it sold for when it changed hands. Only rarely, however, does it mention buildings or capital improvements to the property. Most properties in Wisconsin have had their chain of title abstracted, although the practice has recently become less popular, and owners have turned to a simple title guarantee. Usually, either the property owner or a mortgage holder has custody of the abstract; but a previous owner might hold an out-of-date version. Newspapers provide a unique look into a communities past. House researchers may find articles about house construction, land transactions, social notes and obituaries of past owners. Descriptions of the larger homes were sometimes given in great detail. It is very helpful to know the approximate year of construction. It is a little like looking for a needle in a haystack, but if you persist, you may find detailed information that exists nowhere else. The Lake Geneva Library has, on microfilm, a fairly complete collection of our old newspapers. 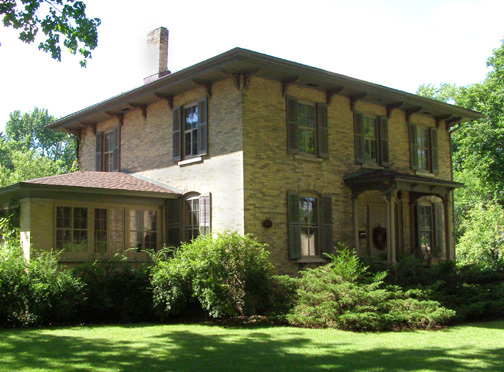 IDENTIFYING FEATURES: 2 or 3 stories; low-pitched roof, widely overhanging eaves; large, decorative brackets beneath eaves; tall, narrow windows (most often on commercial buildings), commonly arched or curved above; some with square cupola or tower (campanile), elaborate wrap-around porch (or smaller entry porch) with decorative Italianate double columns and other details. This was the dominant style in the U. S. in the mid and late nineteenth century. 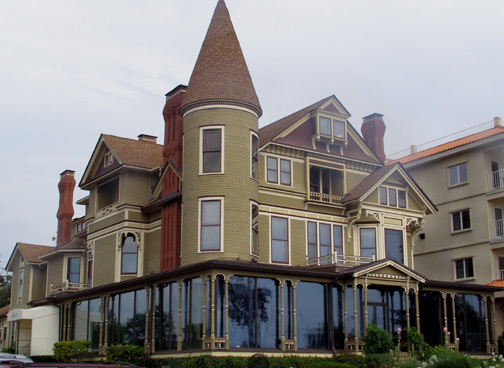 IDENTIFYING FEATURES: Steeply pitched, irregular roof shapes; dominant, front-facing gable; patterned shingles, bay windows, multi-color and decorative ornamentation; partial or full-width porches of one story; multiple gables and dormers; occasional towers and turrets, rounded or square. Differing wall textures are their "hallmark". This is the most eclectic style of the Victorian era. 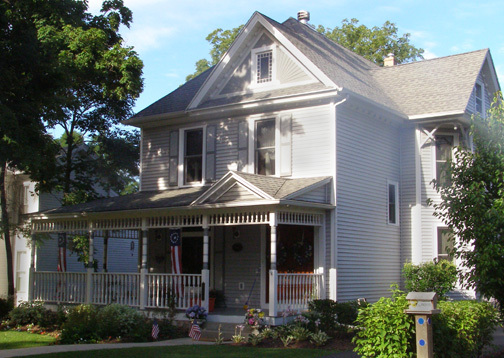 IDENTIFYING FEATURES: Porches with spindlework detailing, L-shaped or gable-front plan, cornice brackets, details often with Italianate and/or Queen Anne inspiration. Basically, working-class or middle-class versions of Queen Anne. Simpler details and basic, asymmetrical floor plans. 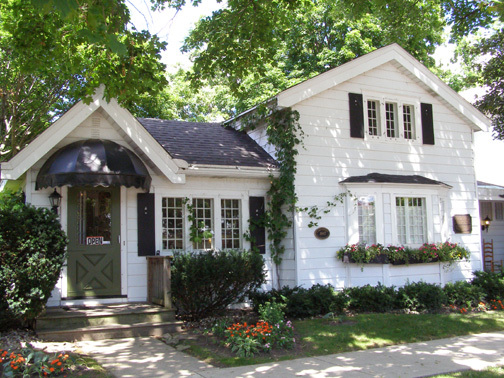 IDENTIFYING FEATURES: Low-pitched, gabled roof, wide overhang of eaves, exposed rafters (rafter tails) under eaves, decorative brackets (knee braces or corbels); incised porch (beneath main roof); tapered or square columns supporting roof or porch; 4-over-1 or 6-over-1 sash windows, often with Frank Lloyd Wright design motifs; hand-crafted stone or woodwork, often mixed materials throughout structure. 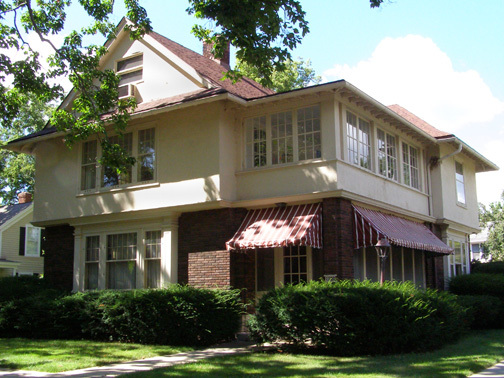 IDENTIFYING FEATURES: This is one of the few indigenous American styles, developed by a creative group of Chicago architects known collectively as the Prairie School. 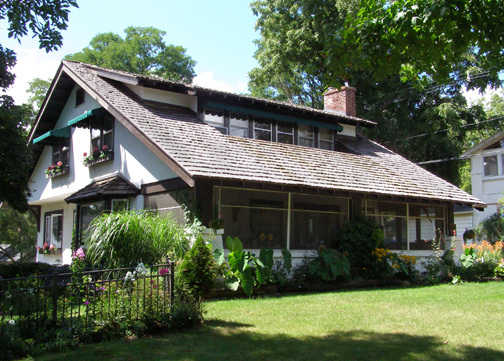 Frank Lloyd Wright is essentially the "father" of Prairie style. Wright's prairie style focused specifically on horizontal, open floor plans representing the expansive prairie region. The prairie style made subtle use of Japanese architecture, specifically that culture's use of horizontal space, flowing interior spaces, hipped roofs with broad eaves, and long bands of windows that apparently invoke the idea of Japanese screens (small, patterned pane glass). Though short-lived in the U.S., this is the first American style to be taken seriously in Europe.